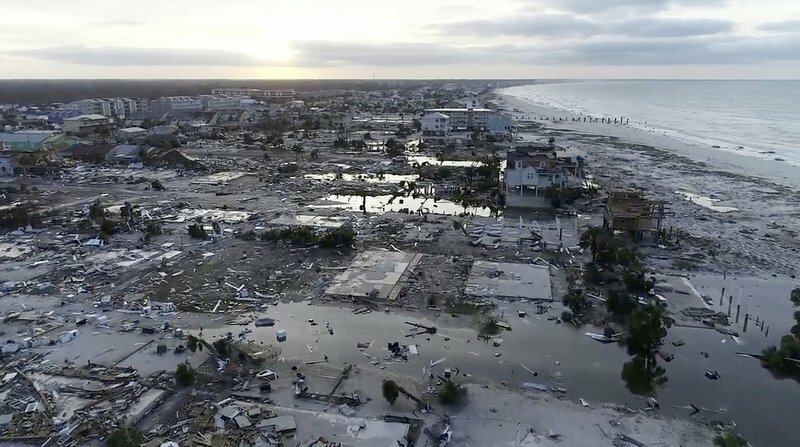 A report published Thursday by Christian Aid, a U.K.-based charity, found that 2018’s top three most expensive climate-driven events worldwide took place in the United States. They were hurricanes Florence and Michael, followed by California’s wildfires. 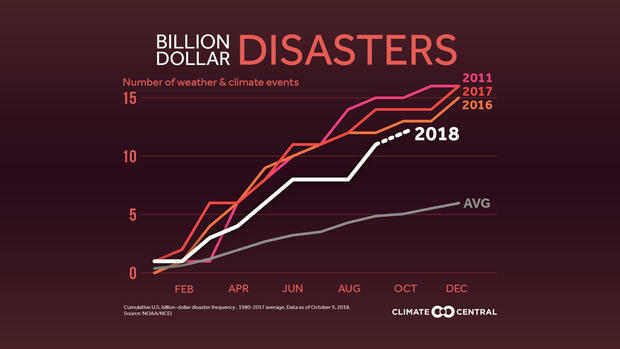 With 12 distinct billion-dollar events tallied so far in the U.S., 2018 also ranks fourth among the years with the greatest number of billion-dollar disasters, according to NOAA’s National Centers for Environmental Information. All of the top four years in terms of extreme weather event costs are recent — in addition to 2018, they are 2011, 2016 and 2017. This is no coincidence: we have more expensive stuff in harm’s way and climate change is super-charging storms. As a result, extreme weather is happening more frequently, and the damages that go along with it are increasing. The Christian Aid report focused on 10 of the most destructive weather events around the world in 2018. Topping the list were hurricanes Florence and Michael, costing an estimated $17 billion and $15 billion this year, respectively. “There will not be any new normal as long as greenhouse gas emissions continue to push up global temperatures – extreme weather events will constantly become increasingly common and more extreme,” it said. Florence, at one point, was a Category 4 storm with winds of 140 mph. By the time it made landfall on September 14, however, it weakened to a Category 1, and its slow speed at that time is what defined the hurricane. Because of how slowly it moved over land, it will be remembered as the worst flood in modern history for much of southeast North Carolina and parts of South Carolina. Both states set new all-time rainfall records, with a maximum total of nearly 3 feet in North Carolina and almost 2 feet in South Carolina. The damage is estimated to be $17 billion, according to Christian Aid. New studies show slower-moving tropical cyclones and a warmer atmosphere caused by climate change result in hurricanes dumping heavier rain. 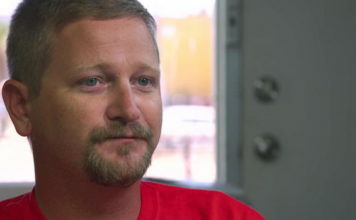 Michael will be remembered for ferocious 155-mph winds in its core. 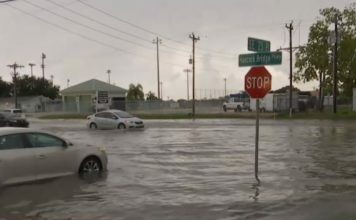 Energized by above-normal water temperatures — in the low to mid-80s — over the northern Gulf of Mexico, the storm rapidly intensified 80 mph in just 48 hours. When it made landfall, it was still intensifying and almost became a Category 5 — the strongest of hurricanes. It was the strongest storm on record to make landfall in the Florida Panhandle, the strongest U.S. mainland landfall in October, the third strongest landfall by pressure, and the fourth strongest by wind. In total, damage estimates for the storm are between $15 and $25 billion, according Christian Aid and Bloomberg News, respectively. New studies show that warmer water caused by climate change is likely to fuel a greater number of Category 4 and 5 storms. For the people of California, the state’s deadliest and most destructive wildfire season on record will remain burned in the memory of residents. Close to 1.9 million acres have been ravaged, placing it ahead of the historic 2008 season, which burned 1.6 million acres. The state’s Camp Fire cost an estimated $7.5-10 billion, according to Christian Aid report, while the Woolsey Fire cost an estimated $1.5-3 billion. California wildfires are caused by an ignition, either natural or human caused, combined with very dry, warm conditions and bursts of gusty down-sloping winds. These conditions are present almost every fire season, and that was especially true in 2018. But as the climate changes, scientists have found that fire season is now almost three months longer and the number of acres burned in the American West have increased dramatically since the 1970s. Toward the end of March, severe weather and tornadoes, including an EF3 tornado, pummeled the Southeast, causing $1.4 billion in damage. In early May, a large severe weather outbreak with tornadoes, large hail and wind swept from the Plain states to the Northeast, costing another $1 billion. Mid-May featured back-to-back derechos, known for damaging winds. That event hit hard from Pennsylvania to southeast New England down to Washington, D.C., costing another $1.4 billion in damage. The most memorable event of May, however, was disastrous flooding in Old Ellicott City, Maryland, on the 27th. Eight inches of rain fell in just a few hours, causing a cascade of rapids in the city center. In a sight not seen in modern history, dubbed #foureaster, four nor’easters pounded the Northeast on March 2, March 7, March 13 and March 21. The first of those storms alone is estimated to have cost $2.25 billion, with nearly 40 inches of snow in the Catskills of New York and a wind gust to 97 mph on Cape Cod. The succession of four back-to-back storms had some meteorologists wondering if climate change may somehow be loading the dice for unusual events like this. Estimated to have cost $1.1 billion in damage, the impacts of the bomb cyclone were felt from Florida to Maine. Measurable snow was reported as far south as Tallahassee, Florida, for the first time in nearly 30 years. The worst impacts were seen in eastern Massachusetts, where Cape Cod reported 2 feet of snow, hurricane force wind gusts and all-time record breaking storm surge flooding in Boston.